Xpensive Taste invited to audition for 106 & Park W.O.W. Blaze The Stage! 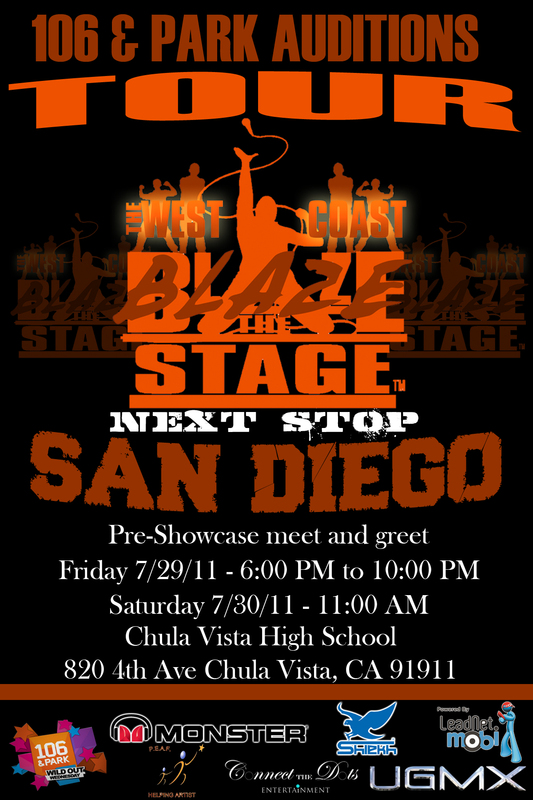 We are excited and proud to announce that we have been selected to participate in the Blaze the Stage San Diego event! We will be auditioning for a chance to perform on 106 & Park's Wild Out Wednesday (W.O.W). Any singer, singing group, dancer, dance group and/or rapper that is hot (T.V. Ready) may get invited to BET 106 & Park “WildOut Wednesday” and/or “Freestyle Friday”. This event will be held at the Chula Vista High School Performing Arts Center. Blaze the Stage gives talented Singers (in all Genres), Singing Groups, Dancers/Dance Groups and Rappers the opportunity to perfrom in front of entertainment industry executives with the possiblity of being invited to New York City to appear on 106 & Park's "Wild Wednesday" and/or Freestyle Friday"
General Admission - This is the first day of the Audition is an Entertainment Industry Day. Although the first day is informational. We planned for it to be entertaining. The second day is Audition Day. It is an Open Audition judged by Entertainment Industry/ T.V. Network Panel.